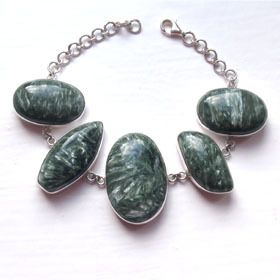 Seraphinite is a little known and unusual gemstone which combines rich forest greens with shards of silver mica. The patterning within the stone is feathery and fine. 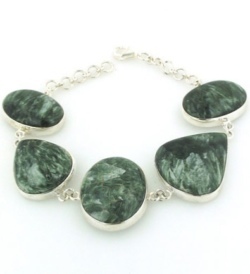 Our seraphinite silver bracelets coordinate well with many shades of green and look classy with asterling silver necklace. We have hand selected these seraphinite gemstones. They are of the highest quality and show this gemstone at its best. The richness of colours, the feathering patterns and the spread of silver throughout the gems is exemplary. 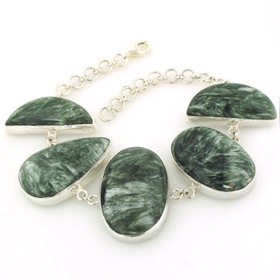 Wear your seraphinite bracelet with green amethyst earrings.